MSW - Line Pattern Beveled Edges Gold Diamond Wedding Ring A standout statement piece with Madani’s signature sparkle, this Line Pattern Bevelled Edges Gold Diamond Wedding Ring will make a striking addition to your jewellery collection. Adored by modern brides and grooms for its bold design, it features a concave band with smooth bevelled edges, grooved vertical accents, brush detailing, and a dazzling 0.05ct square princess diamond. This designer wedding ring is offered in white and yellow gold. A standout statement piece with Madani’s signature sparkle, this Line Pattern Bevelled Edges Gold Diamond Wedding Ring will make a striking addition to your jewellery collection. Adored by modern brides and grooms for its bold design, it features a concave band with smooth bevelled edges, grooved vertical accents, brush detailing, and a dazzling 0.05ct square princess diamond. 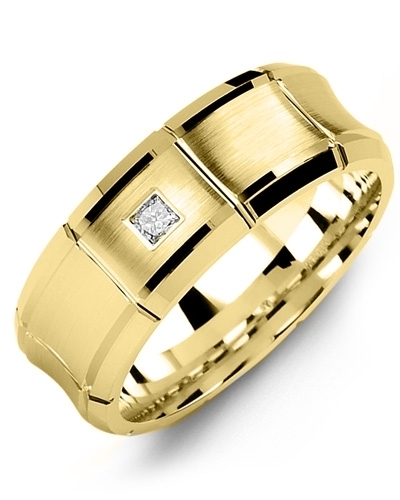 This designer wedding ring is offered in white and yellow gold.